Since the influx of voting technology funding attached to the Help America Vote Act has largely been spent updating to electronic and optical scanner voting methods, there have been new efforts to make existing technology better. Integration of personal electronic devices may be on the horizon, but discussions about internet voting systems are premature given current capabilities. In order to address the shortcomings of each of the two popular voting methods – Direct Recording Electronic machines (DREs) and Optical Scanners – supplementary technology is being added in some areas. One of the major issues with DREs is that once the ballot is cast, there is no way to verify that the computer recorded it correctly. Simply trusting the software is non-transparent and potentially unsecure. To combat this issue, many DREs have been adding a system that prints a paper receipt that the voter can review before submitting their final ballot. This system is known as Voter Verified Paper Audit Trail (VVPAT), and ideally increases voter confidence while also producing a paper record that can be recounted if need be. An issue with optical scanner voting machines is that the ballots are more likely to be mismarked, especially by those who are disabled in some way. Now, these machines are capable of producing an audio record of the marked vote. This technology allows people who are visually impaired to hear their vote before confirming it. Some states and localities are experimenting with the integration of electronic devices to make voting more accessible and more efficient. 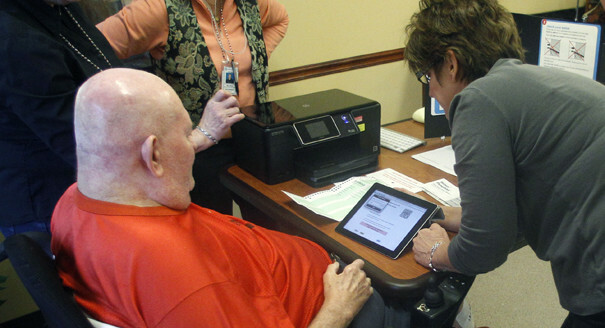 In 2011, Oregon introduced a system of bringing iPads to long-term health facilities and allowing residents to make selections on the tablet that are then printed on a regular ballot. An iPad is easier for voters with limited dexterity or impaired vision to use than a paper ballot. Another system being explored in Johnson County, Kansas has been called “bring your own voting machine.” With this system, voters can render a ballot on their smartphone or tablet and then print it at the polling place. Officials hope that this system would reduce costs and allow voters to use technology they are accustomed to. Interest in internet voting has been gaining traction over the past decades as the internet has become integral to many people’s lives. The idea of voting from your phone at home may be tempting, but there are many drawbacks that will likely prevent internet voting for the time being. Overall, there is a general lack of transparency and security. Concerns regarding voter authentication and the ability to audit (verify and review votes) elections are major obstacles in maintaining fair voting methods. Many believe that online voting systems are inherently vulnerable to attacks and manipulation through hacking and other foul play. With no reliable way to have an independent record of online votes, such a system is unlikely to move forward on a large scale with current technology. Despite the risks, many states are experimenting with ballots being returned via internet for military and overseas voters who may not have any other method of returning a ballot. Depending on the success of this system, perhaps there will be some modest expansion of internet voting in the near future.